Now more than ever, consumers are looking for brands they can trust. They want brands that they can believe in, which have the knowledge and the experience to be an industry leader. The way to establish your brand as a trustworthy leader is by showing that you are well informed and in touch with the marketing trends of the day. This can be done by sharing the latest news and views from marketing research reports. To guide your brand to the best reports, Software Advice featured four on the B2B Marketing Mentor that can help you strengthen your leadership status. 1. 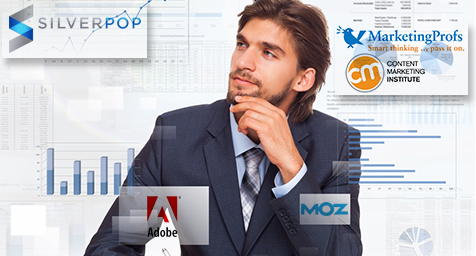 “2013 Digital Marketing Optimization Survey Results” from Adobe ­– Adobe is well known for designing tools to help marketers develop, deploy, measure, and optimize all of their digital content. To remain a leader in digital marketing solutions, the company regularly conducts and analyzes research regarding the requirements of the digital marketers they serve. This latest report contains information on the mobile, social, customer experience, and personalization needs of nearly 2,000 digital marketers in North America, Europe, and Asia. While it contains an abundance of data, the highlights are funneled into friendly graphs, narrative explanations, and useful takeaways. 2. “2013 Search Engine Ranking Factors Survey” from Moz – Search marketing experts know to go to Moz for helpful hints on optimizing their content and sites for optimal search rankings. This new report features perceptions and suggestions of the factors affecting search rankings. As always, Moz makes it easy to sort through the data with helpful correlation graphs that filter all of the factors. 3. “2013 Email Marketing Metrics Benchmark Study” from Silverpop – The digital marketing platform offered by Silverpop unites marketing automation, mobile, social, and email to let users personalize the customer engagement experience. The company frequently shares its insights through well-regarded research reports and its latest examines the factors that affect email performance. This report provides much more than simple averages to let marketers compare their performance to competitors in the industry. 4. “B2B Content Marketing 2014 Benchmarks, Budgets, and Trends” from Content Marketing Institute and MarketingProfs – Content Marketing Institute (CMI) offers advice, insights and information on perfecting the practice of content marketing. In this recent report, CMI partnered with MarketingProfs to examine today’s trends and tactics in B2B content marketing. The report is packed with facts and figures, but they’re arranged by idea and insight and then clearly expressed through graphs and lists. Check out these four research reports and leverage their facts to make you a leader. Keep up with the latest trends in marketing and branding. Contact MDG Advertising today at 561-338-7797, or visit mdgadvertising.com. MDG Advertising is a full-service advertising agency and one of Florida’s top branding firms. With offices in Boca Raton, FL and New York, NY, MDG’s core capabilities include branding, logo design, digital marketing, online advertising, print advertising, email marketing, media planning and buying, TV and radio advertising, outdoor, newspaper, video marketing, Web design and development, infographic development, content marketing, mobile marketing, social media marketing, and search marketing. To learn more about digital marketing, contact MDG Advertising today at 561-338-7797.